After quite a number of years of playing bass in a rock & roll band in Austin, I quit making music for a while. The last breakup of the band (there were many along the way – we burned through guitarists the way Spinal Tap burned through drummers) was rough. Very rough. Divoice-like in its intensity. And I just had to set things aside for a while. Sure, I still played bass and guitar some, but I definitely wasn’t pursuing music with anything even remotely resembling aggressiveness. Then, in about 2003 the bug bit me anew and I started making music again. Partly this was because Apple introduced Garageband, which meant affordable technology had finally caught up with me and I could write and record at home, easily and on the cheap, without having to drag myself through the aggravation and disappointment of dealing with other people. 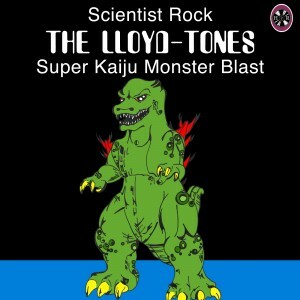 And so the lloyd-tones* were born. But why insist on acting like there was a band when there wasn’t? Why not just release stuff under my own name (a la Tom Waits or Bruce Springsteen, etc.)? It’s mostly because I’m an old Minutemen-style punk rocker at heart and not a screaming egotist, I reckon. There are probably other reasons, but that’s likely the key one. This nomenclature decision also informs my approach to making music. What that really means is that, though I’ve theoretically got an infinite sonic palette available to me through the wonders of technology, I have (and will continue to) approach writing and recording as through I possessed only a (reasonably) limited suite of instruments, amplifiers and effects. The outcome of this should be that any given album produced by “the lloyd-tones” will sound like it was made by an actual, honest-to-goodness band and not some jerk in a studio who doesn’t care about the possibility of ever needing to reproduce the music live. This is, of course, a personal taste issue (kind of like how I prefer Rubber Soul ad Revolver to Sgt. Pepper ) and not a grand insight into the world of music. But it works for me. Unfortunately, since it really is just lil’ ol’ me doing everything (and reporting to no one), the pace of production can be painfully slow. Witness the fact that there’s really just one six-song EP and a handful of “singles” available. But hey, genius moves at its own pace. So, it turns out, does sub-genius. Jack Kerouac was one of my favorite authors for years. Technically, he still is. But at my age its hard to keep romanticizing a guy who had as many problem and as much baggage as Kerouac did. I don’t think I’ve actually read any Kerouac in a good 15 years, and that’s probably a shame and something I should correct. But there’s only so much time in the day. I’m better off keeping my memories and using the spirit of Kerouac as a prod to keep myself writing and living the life I want to than I am revisiting a bunch of books that I might find I don’t enjoy anymore. 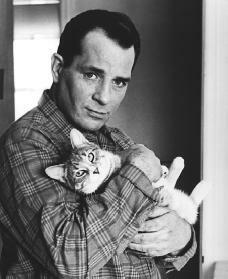 The one connection I still feel like I maintain with Kerouac is our mutual love of rich & imaginary baseball worlds. I alluded to this earlier (in the post on baseball proper, not the one on imaginary baseball). If you’re not familiar with Kerouac’s baseball game (and the obsessive records he kept of it), you should probably google it. It’s absolutely riveting stuff (if you’re the sort to be riveted by such things) and tells more about the author than – possibly – anything he ever wrote or was written about him. Actually, I’m lying. There’s one other connection I still share w/ Jack. I, too, love cats. I just don’t have any anymore because I live with birds. No offense to the birds, but I do miss having a cat around. I’m in love with a guitar*. It’s the guitar that seems to have been built just for me. 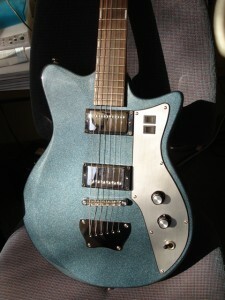 I’m talking about the Ibanez Jetking II (first run only). 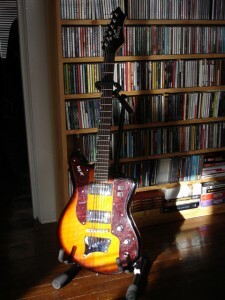 At the time it was launched (2003-2004) I was getting back in to making music for the first time in a good five or six years, and I needed a new electric guitar. So I went on a guit hunt. I knew I didn’t want a Stratocaster or Telecaster (as great as they are, I was tired of them) and I’ve just never quite been a Les Paul kind of guy. I did have an interest in Fender Jazzmaster & Jaguar guitars, since they were Fenders, but they were out of my price range, alas. Then I remembered Ibanez. Historically, they haven’t produced the type of axe that interested me (too flashy & metal! & aggrofunky), but my first guitarist had an Ibanez strat-equivalent that seemed solid (and affordable, for the 80s, anyway). So I figured I’d check them out. By sheerest coincidence (or perhaps due to cosmic intelligence intervention?) I started looking just as Ibanez launched the Jetking II. The Jetking I had come out a year earlier and was generally well regarded, but it was not quite right for me (somewhat junky tuners, basswood body, thin neck). The JTKII on the other hand, is perfect. It’s got a solid mahogany body, a nice & thick one-piece neck, and solid tuners. Both models feature dual humbuckers that can be coil-tapped to act like single-coil pickups, giving me solid sonic versatility (fender sound, check. gibson sound, check). It’s a highly functional, solidly-built, axe that a ham-handed bassist like me can use without struggling. And I love it. The looks are sharp, too. It’s a great sunburst with miles of tortoise shell pickguard for that extra classy touch. I did wind up picking up a used JTKI as well, in the cool (and somewhat rare) blue color. It called to me from eBay, and though I’m far from being a guitar collector, I really felt I needed to own an original Jetking, too. Call me a sucker if you must. *This is where I note that I am actually – by training, trade and disposition – a bassist first and foremost. And no object in the world is more precious to me than my beloved P-Bass (more on her a little later on). But dayum, this guitar is awesome. I’m a sucker for baseball. Major League baseball. Minor League baseball. Fantasy baseball. Heck, I even enjoy completely imaginary baseball. Yep, I amuse myself from time to time with the exploits of fictional baseball as simulated by a solid little program called Out Of The Park Baseball. I’m not J. Henry Waugh crazy about it, though. I just find that I occasionally want to drift off into a world of make believe, where the difficulties of real life and real baseball don’t matter. It’s a world where the colors are like something from an old photo and the sounds are crystal clear while still being faintly tinny. Part of this is that, despite being very much not a “math guy” I still like numbers. I like box scores. I like the idea that the central stories of baseball can be told with a handful of stats and an understanding of how the game works. It’s a strange kind of magic, and OOTP lets me experience that feeling without having to think about the story behind the story. Unless I really want to. And if I do, I can go crazy telling myself stories of noble heroes and vile villains and their exploits on the diamond. I like to build worlds in my mind. Imaginary baseball lets be do just that. Somebody recently said that Hipstamatic (the “vintage photo” app for iPhones and such) was “like Autotune for photography.” And though I get what they meant, I also have to disagree. It’s not so much Autotune as it is adding analog hiss back into a digital recording for “warmth.” That is, it’s somewhat false and pretentious, but it also helps make digital pictures (which can be exceptionally harsh looking, especially when taken by novices) much more compelling to look at. I say all this as a rank amateur with regard to photography and a far from amateur when it comes to music. I’ve found that the iPhone (and, even moreso, iPod Touch) pics I’ve taken with Hipstamatic are just plain nice to look at, while the regular i-device camera pics are less than enjoyable in most cases. There’s a depth of experience that comes with the faux aging that Hipstamatic does that I appreciate. Of course, that might be just because I’m old enough to remember taking crappy pictures with the kinds of toy cameras that Hipstamatic makes pics look like. And if that’s the case, so be it. I’d rather enjoy pictures than dread them. And I’d rather enjoy taking pictures than doing what I did for years, which was to avoid cameras at all costs. It’s good to have at least some things captured in a way that my failing memory can’t. I don’t update the site very often, but you can see a handful of the Hipstamatic photos I’ve taken at the Tumblr blog I set up for just such things: Lux Caducum. I like to play games. No, not with people’s heads or emotions (well, not outside of actual games, anyway), but actual sit down and play a game games. Board games, card games, dice games, role-playing games, video games, drinking games. You name it. If it’s a game, I’m game. It’s not too much of a stretch to realize that this particular trait of mine is because I grew up playing games regularly. War & SlapJack are probably the first two card games I remember playing with my mom. My folks often had friends over to play Crazy 8s or Hearts or Spades. Risk was an early favorite, too. My grandfather hosted a weekly Poker game for 30-odd years (7 Card Stud, Jacks or better, Trips to win, baby. I never even heard of Texas Hold’em until I was in my 30s. And I’m a lifelong Texan). My childhood best friend & his parents were very into games, too, and since his folks and my mom were very close, we all played a boatload of games together. They were the first people I knew who had a home video game system (a ColecoVision, if I recall correctly), too. And I was fortunate enough to get an Oddyssey 2 for Christmas in 1980 or so. Man, I loved that thing even though (or perhaps all the more because) it wasn’t an Atari. But that’s a facet of my personality to explore another time. Even now, as what passes for an adult, I still play games as often as possible. My wife and I are fortunate to have several other couples we’re close friends with who dig on busting out Carcassonne or Alhambra or just about anything, really. I’ve always found playing games to be an ideal way to socialize with people, since there’s always something there to keep the conversation going even when it might otherwise lag. I’m also working (in fits and starts) on designing a card game. But I’ll save the details of that for another post.